Take a Cycling Vacation Break! It’s that time of year – the real estate market slows down and people go on vacation. Or is it because people go on vacation that the market slows down? My husband and I just returned from a trip to Sardinia and Corsica. Needless to say, we had a great time! We are cyclists and we like to take a week of vacation and go on a self-guided cycling trip someplace fun and then take the week after to relax in and around the area where we just cycled. This is our second self-guided tour; the first was to Ireland. Various companies advertise them. What is nice about the self-guided tours is that everything is taken care of for you – hotel reservations, moving your luggage, and providing bikes and map routes. Instead of cycling with 18 other people and 3 guides, you are on your own to start and stop when you want, which we prefer. It is also substantially less expensive than a guided tour, which we have also done. I’ll confess that if my husband was not along on the trip, I’d probably go with the guided tour. A requirement to go it alone is that you need to be able to fix a flat tire. While I know how to do it, pumping the tire up with those small pumps is a challenge for me. Also, my husband readily takes over and guides us with the maps and the GPS routing device they provide. Sometimes, there is a bit of guesswork involved but for the most part, the maps are easy to follow. What I learned on this trip is to double-check with the company about the difficulty of the ride. We were supposed to be on what was advertised as a “hobby” ride, which is described as “rolling hills and occasional short climbs.” However, it was actually a more advanced ride; one day included a 25 mile Mt. Tam type climb to reach a peak of 2500 feet. Throw in the very hot Sardinian sun and your vacation turns into an unexpected physical endurance test. The scenery in Sardinia consists of the blue-green sea with high mountains in between quaint old Italian villages containing pastel stucco homes. In Corsica, we were able to enjoy some of the most beautiful scenery I have ever seen – white rocky cliffs over clear blue sea. Cycling allows you to see a town close-up and there is nothing like biking into town and stopping at a coffee bar for a café macchiato or a Fanta (which tastes much better in Italy) then finishing off the day with a delicious meal of fettuccine and clams or some fried calamari. 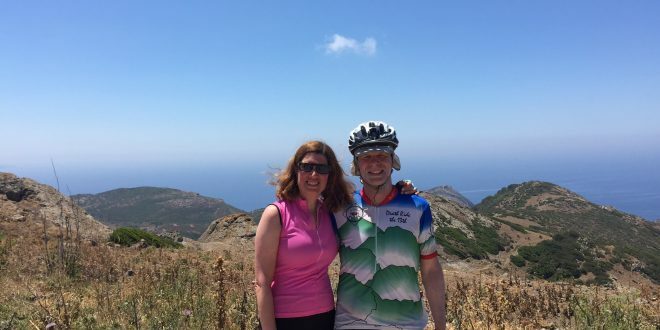 If you decide to go on a cycling tour or go to Sardinia and Corsica, give me a call. I’ll be happy to share some tips with you. Previous: Why There is A Housing Shortage in SF!